The 2019 Audi e-tron – the first fully electric model from the brand – arrives next month. A true mid-size luxury SUV, the e-tron – with an EPA-estimated range of 204 miles – is built for everyday use. The Audi e-tron will be available for demonstrations at Audi dealerships, and customers who reserved the e-tron will soon experience fully electric driving without compromise. 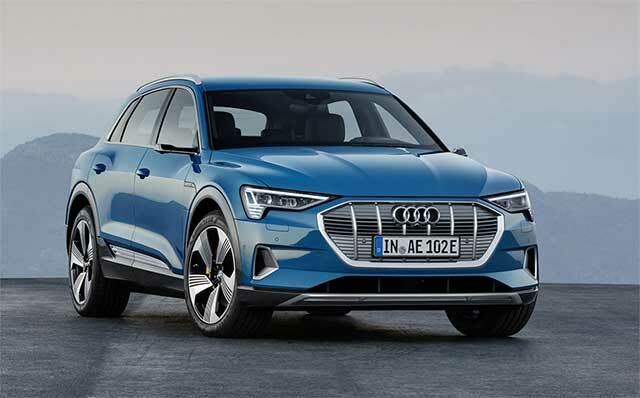 The Audi e-tron is a true mid-size SUV – the largest segment in the luxury SUV market – and provides the fit and finish that luxury buyers expect. Definitively Audi and uniquely e-tron, the model features standard heated/cooled seats, top view camera, distinctive badging and all-new ergonomically designed shifter, in addition to available massaging seats, night vision assistant and a full suite of standard and available driver assistance systems. This engineering approach ensures battery longevity, repeatable performance and peak charging power for longer amounts of time during the charge cycle. A revolutionary cooling system separates the battery modules from cooling fluid to maintain optimal efficiency and enhance performance for the long-term. A key benefit of electric vehicle ownership is the ability to wake up each day with a freshly charged vehicle. Understanding that more than 80 percent of charging takes place at home, Audi and Amazon Home Services collaborated to provide in-home installation of a Level 2 charging system, comprised of a 240 volt, NEMA 14-50 outlet, enabling the e-tron to be completely charged in approximately nine hours.